A ship carrying gifts from Spanish dictator Francisco Franco took nearly a year to unload after running aground in 1968. 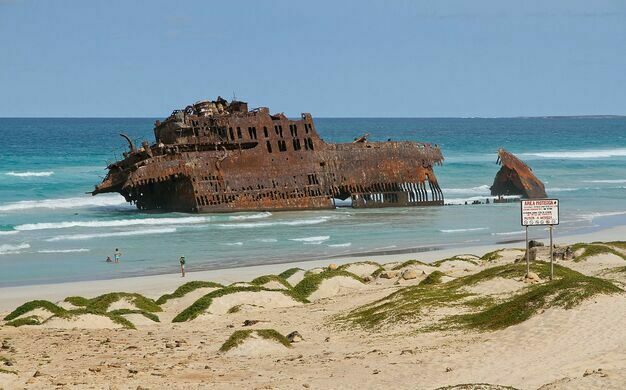 On the northern part of the island of Boa Vista you’ll find the wreckage of a Spanish cargo ship that ran ashore in the fall of 1968. The M/S Cabo Santa Maria was on its way to Brazil and Argentina loaded with a variety of cargo and a number of gifts—sports cars, machines, china, medicine, clothing, food, and beverages—from the government of the Spanish dictator Francisco Franco to give to his supporters. Once a bustling fishing village and trading post, today these Cape Verde ruins provide a home only for seabirds and turtles. Unfortunately, in the early morning hours of September 1, the ship ran aground on the coast of Boa Esperança. A tugboat was sent from the island of São Vicente to try to dislodge the ship, but to no avail. Fortunately, the crew was able to escape the scene unhurt. That left just one thing to deal with, and it was no small feat. A good part of the population of Boa Vista, children as well as public employees and machine operators from the other islands, were mobilized in order to remove the cargo of the ship. They used mules and donkeys to carry the cargo to the nearby capital of Boa Vista, Sal Rei. The unloading of the ship was carried out for nearly a year. Today, the ship is slowly crumbling. After almost 50 years of battering by the wind and constant waves, much of the deck and hold have disappeared, and only a rusty shell remains for the time being… but visibly not for long. Over the decades the shipwreck has become a symbol of the island and a source of inspiration for artists. The site can be reached with a 4WD vehicle via a scenic rout of untouched nature. More adventurous visitors can get there on foot from Sal Rei (around 7 km). This giant statue is the product of a mixture of corruption, Stalinist architecture, and North Korean manpower. This unique religious structure is an architectural gem with arresting ocean views. The site of the earliest colonial settlement in the Bahamas started as a place of religious refuge.